For the exhibition Made in America, architect and designer Arthur Casas—who has studios in São Paulo and New York—brings the sights, scenes, and even the smells of his native Brazil to New York's Tribeca. Upon entering the space, visitors are greeted with a montage of scenses from Brazil projected over Casas's architectural drawings—and a signature scent created by cosmetics company Natura. 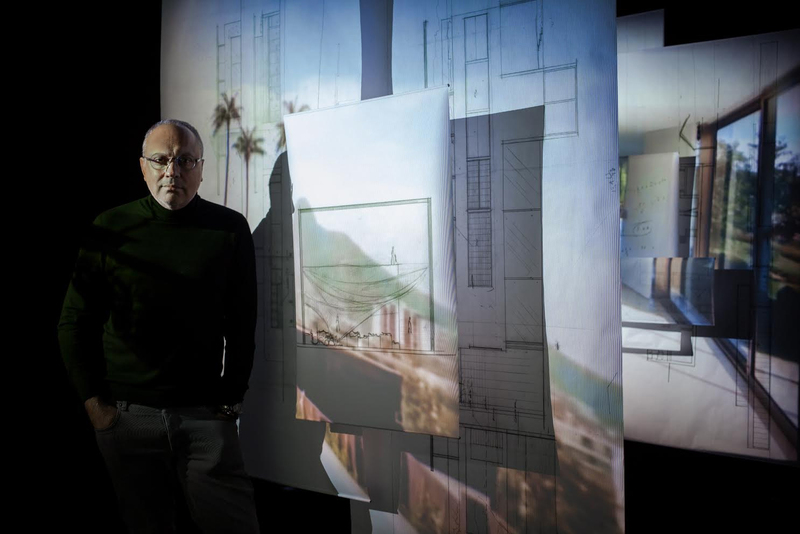 The dramatic entrance does more than transport visitors to South America, it also gives a glimpse into the designer's process—as Casas points out, he still begins all his designs with a sketch by hand. "Brazil is everywhere," Casas says of the country's influence on his work. "It's very common in Brazil that you don't take things away, like small piece of marble, when cracked. They put everything together." The mosaic surface of his Tiles coffee table is an example of that approach to materials. The influence of Brazil on Casas's Copacabana sideboard is easy to see—its curves recall the pattern of the sidewalks at Rio's most famous beach. The exhibition at Espasso also explores materials, craftsmanship, and aesthetics from the North America—minimalism in particular. Casas's angular Quilombo desk was made in the USA of American walnut and wrought steel. The relationship between north and south isn't the only connection on display at the show. Architectural models give insight into the designer's building practice, echoing the lines of the furniture on display. Arthur Casas Made in America runs through March 27 at Espasso, 38 North Moore Street, New York.